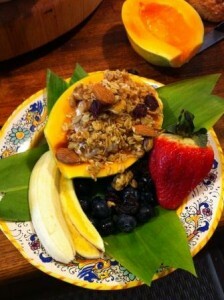 We use our own and other locally grown fruits whenever possible to make our delicious breakfasts each morning. 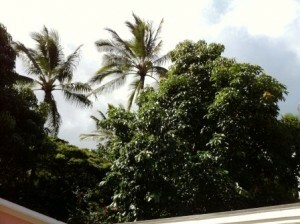 We are fortunate to have a wide variety of fruit trees and other tropical plants growning at the Kauai Beach Inn. These are just some of the many fruits we grow on the property. of these for breakfast, their excitement increases. 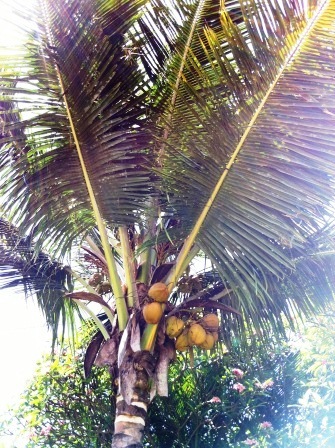 There’s nothing quite like eating exotic tropical fruits picked fresh from the tree to give you a true taste of paradise. Even guests who “don’t like papayas” or other fruits are often shocked to discover that, well, “maybe I’ve never had a good one before….” Nothing could make us happier! Another compliment we receive on a pretty regular basis is from guests telling us how good our coffee is. While we’d love to take all the credit, being just down the road from Hawaii’s largest coffee plantation probably doesn’t hurt. We proudly serve freshly-ground, locally-grown and roasted Kauai Coffee as part of our tropical breakfasts. People who are used to buying commercial produce tend to forget how good it is when you eat it right where it was picked. We’d like to help you rediscover the joy of “tree to table” dining. One thing about the Garden Island is that things sure do grow here. 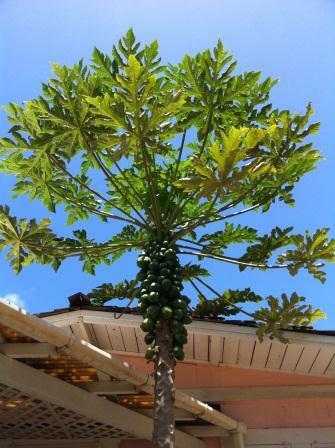 This papaya tree, filled with ripening papayas, was about 18 months old when this photo was taken. 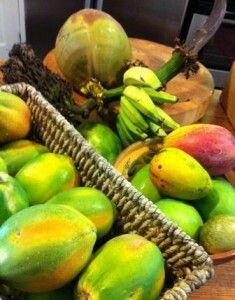 If you like mangoes, you will LOVE these mangoes! 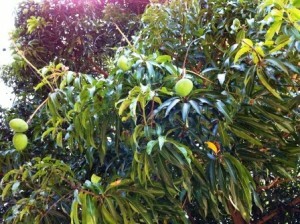 Mangoes are not uncommon on Kauai, but this tree is well-known for its amazing fruit, which is very much in demand. Oh - and it's humongous. Of course, it's not only our guests who enjoy the fruit trees. 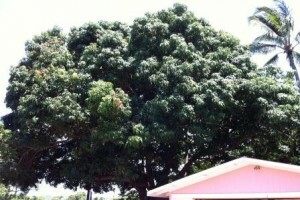 You probably can't see the avocados on this tree, but there are quite a few of them. 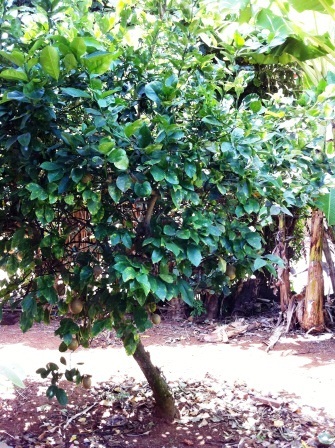 This lime tree may be small, but it produces a lot of limes. 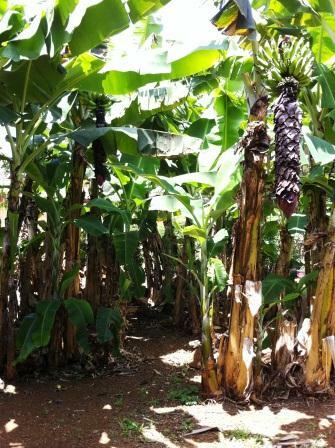 While technically not a tree (they're actually herbs), banana plants abound at the Kauai Beach Inn. This is how pineapples grow. They're on a nearby plantation (not on our property). 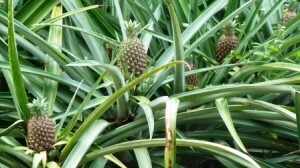 One pineapple grows on each plant and takes 2 years to reach maturity! 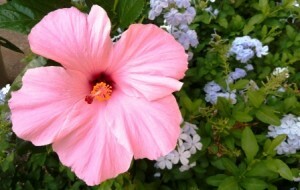 The hibiscus is the state flower of Hawaii, and we have many of them growing here at the Kauai Beach Inn. 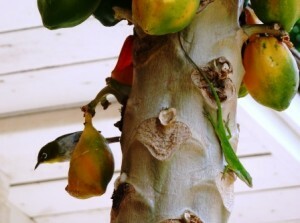 Many of our guests are surprised to see them in tree form, which is their natural state.